ROMANCE BOOK PARADISE: Welcome debut author Emma Reed! Welcome debut author Emma Reed! 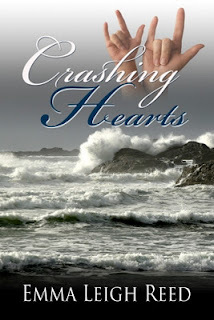 Today we're welcoming debut author of Crashing Hearts, Emma Reed! But before we give over to her, please check on this Blog's sidebar for links to follow Helen Lacey, Tracy Sumner and Nina Singer for giveaways! Free books, Amazon Gift Cards and Amazon Kindle at stake! Who is your hero? When I was a kid, my daddy was my hero. He could do anything, make anything better. Okay, he's still my hero. Regardless of how old I have gotten, my dad can still make things better with just a smile, a hug or just a cup of coffee and a chat. As my children grow, I wonder whom their heroes are. My oldest daughter is in her sophomore year at college and states her younger brother is her hero. He has inspired her to go into the field of speech and language pathology with his hard work to overcome, and live a normal (whatever normal is) life with his autism. My son has worked hard to overcome his nonverbal state. He learned sign language in order to communicate with us, and then after the age of three started to verbalize. He spent a lot of hard work on occupational therapy to control his sensory overload. When I wrote my first book, CRASHING HEARTS, my hero in the book was very similar to another one of my heroes -- my husband. The hero in my story was kindhearted, loving and had a quiet strength about him. This is a man that is supportive, encouraging and just picks you up when you are down. CRASHING HEARTS wouldn't have been written without that support and encouragement from my husband. Kira Nichols is raising her autistic son alone while dealing with the guilt she has lived with for years surrounding her husband’s death. Grant Rutledge returns to his hometown to help take over the family business and to repair the spiked heel to his broken heart. When he runs into a beautiful, overprotective mother and her nonverbal son, sparks fly and his chance to be part of a loving family seems possible again. When Kira discovers a secret from Grant’s past, she second-guesses her heart. She must overcome her suspicions and haunting ghosts from the past in order to get what she wants – if it’s not too late. To build the family Grant has always wanted, he has to learn to follow his heart. Print: Order directly through author. A hero doesn't have to be perfect but he should inspire others. One thing he never does is complain unnecessarily! It sounds like this book has been written with a lot of love behind it. Sounds great. All the best! Sounds like a wonderful story and a great book! Your son's story is so inspiring, Emma, and I love the sound of Crashing Hearts! Congratulations on a great book. Thanks for stopping by Maria, Gina, Denise, Romance Reader, Lacey. I hope you all enjoy the book if you read it. It really was a work of love. This sounds like a sweet story with a lot of heart. I enjoyed reading the blurb and Emma's take on heroes. Thanks for stopping by, Medeia. Emma, I love hearing how you describe your father. Sounds like your book has many layers. Good luck! Welcome and thanks for coming along to chat with Emma on her hero inspiration! Hallo.I have visited your blog.Do You want visit the my blog for an exchange visit?Ciao. I like my heroes down to earth and real. Congrats to Emma on 'Crashing Hearts'! To me heroes can be found in selfless acts. Crashing Hearts sounds wonderful. My heroes are people who keep fighting adversity to achieve things other people thought were impossible. Dad's make the greatest heroes. Congratulations on your book. My Grandfather has always been my hero. He's 91 and as charming as ever. My ideal hero? Someone who goes against the tide and succeeds at what they do.